In today’s challenging times, keeping your business identity current is essential. Rebranding and updating an identity several times throughout a lifespan is a natural process. 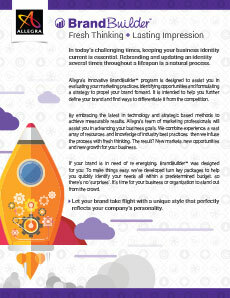 Allegra’s innovative BrandBuilder program is designed to assist you in evaluating your marketing practices, identifying opportunities and formulating a strategy to propel your brand forward. It is intended to help you further define your brand and find ways to differentiate it from the competition. By embracing the latest in technology and strategic-based methods to achieve measurable results, Allegra’s team of marketing professionals will assist you in advancing your business goals. We combine experience, a vast array of resources, and knowledge of industry best practices; then we infuse the process with fresh thinking. The result? New markets, new opportunities and new growth for your business. If your brand is in need of re-energizing, BrandBuilder was designed for you. To make things easy, we’ve developed turn-key packages to help you quickly identify your needs all within a predetermined budget, so there’s no ‘surprises’. It’s time for your business or organization to stand out from the crowd.